The term iguana refers to a large species of typically New World lizards that regularly grow to more than 5 ft in total length. Marine iguanas will often swim along shore but can dive to depths more than 35 ft, remaining submerged for up to 45 minutes feeding on algae. Their sharp spines and tough, flat faces give them a foreboding appearance. Excess salt is removed from their body via a salt gland. This gland releases the salt into the nose, where it can be sneezed out. When approached, marine iguanas can puff a kind of steam through their noses, intimidating predators like the dragons of old! The common iguana eats both plants and animals, including leaves fruit, insects, birds, and small mammals. 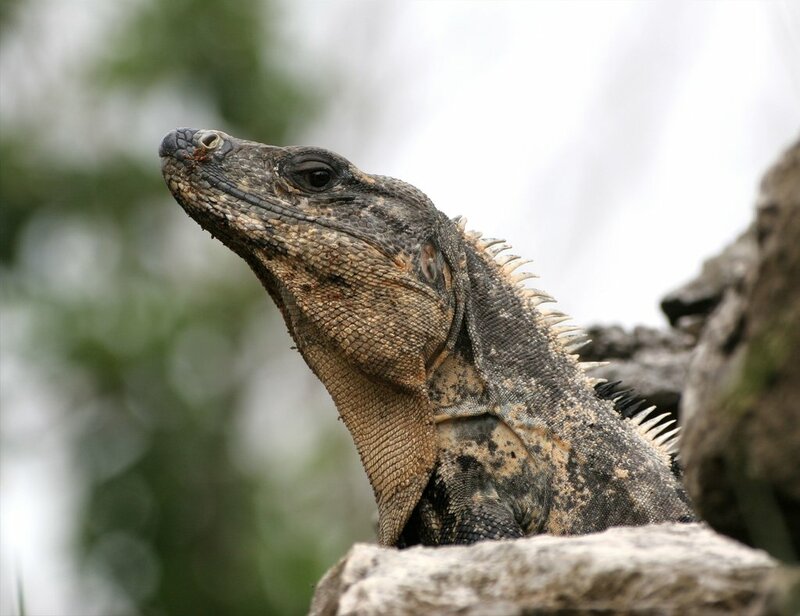 The biggest iguanas have grown to about 6 ft long and weighed almost 12 pounds. These diverse lizards can have a wide variety of colors: orange, brown, green, yellow, and even blue. Dominant iguanas often have a darker color than a lower-ranked iguana. 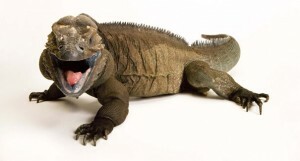 Iguanas have small, pointed, serrated teeth. The well-known dinosaur Iguanodon received its name because its teeth resembled those of the iguana. Both black and green iguanas have been used as a food source in South America for thousands of years. The black iguana Ctenosaurus (lower right) has a particularly spiny tail that it can use to strike painful blows on predators, often cutting into the flesh, much like the stegosaurian dinosaurs would have done. To the left is a strikingly handsome sailfin dragon (Hydrosaurus) which grows over 4 ft. in length and usually lives near streams in Indonesia and the Philippines. 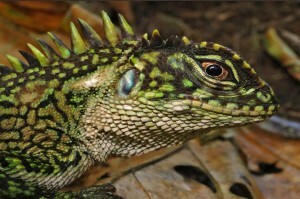 These lizards are popular because of their “dinosaurian looks” (endowed with magnificent spikes and crests). They are similar to the water dragon, which is known in Australia. Aided by fringes on the toes of its hind feet, this remarkable lizard can run on the surface of the water for some distance before sinking and swimming away. 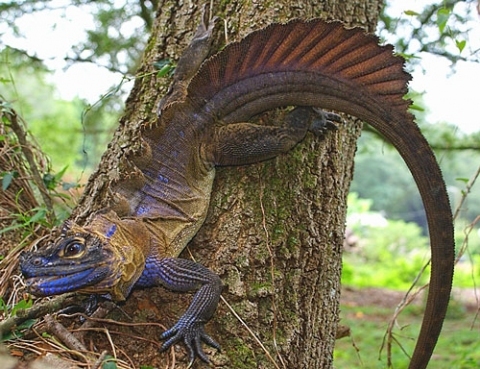 The water dragon can also hide for hours underwater to escape detection. Australian water dragons are carnivores, feeding on ants, spiders, crickets, caterpillars and even small rodents.